Every school leader wants to build a collaborative school culture. The question is are you guilty of these mistakes and is there something you can do about it? 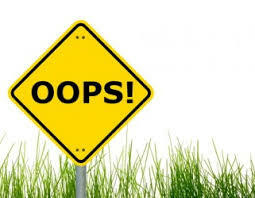 An OOPS means there is room for change! With the winds of October blowing in the air we can also feel the calmness of the school day begin to make way. The children have settled into a routine and there is a lot less crying. As a school director you may have begun to settle into some sort of routine. You are grateful for less fires and emergencies that September had, however you still feel like you are catching your breath. Even more so, you may be seeing new problems brewing at the surface and you are deciding whether you should let is fester further because you don’t have time to deal with it, or should you dig in and see how to make it better? You may be noticing a few or all of the following things happening in your school. 1. Very emotionally needy teachers knocking your door down at all hours of the day. They need your attention and they want it now. This activity alone is eating so much of your day you barely have time for anything else…. 2. Teachers are coming late, taking off, giving in their 2 week notice or worse just quitting! “This isn’t my passion or calling” is their response when you look in horror as to how in the world will you find coverage for the class and stay in ratio?! 3. Every time you try to hit your “To do” list something else comes up and someone else needs your attention and there is just one more phone call to return, one more email to respond and just one more parent that has a question. Before you can blink it’s 7pm and the building is quiet. Now you can get some work done…. Only to rinse and repeat this cycle everyday till burnout and exhaustion get the better of you! In my time of working with EC Leaders from all over the world, I’ve found 3 common mistakes that they keep making again and again. The problem with repeating these mistakes is that it’s costing you in more ways than you can care to think about. What are the 3 mistakes? When you come to school in the morning you only have a basic idea of what you want to do that day. However you don’t take the time to properly plan what each hour will look like and what are the most important projects that need to get done that day. So what happens is – the day hits YOU! and you become the punching bag for everyone else’s issues. You need to solve everyone’s problems and you feel like the savior and rescuer! Yes you need to be there for your staff. And you also need to block out times of the day that are dedicated to the most important projects of building the school. If you spend all day putting out fires, how will you ever grow the school? You stay in survival mode your entire life! Want to know what you day should look like? Join the EC Leadership Conference to learn more. Mistake #2 – Passing the Buck! You are working your tail off to get the school growing. You are putting in more hours than you can count and staying late and sacrificing your family and everything so that you teachers can have what they need etc. And then what do you get in return? Ungrateful teachers, disgruntled parents, and lots of discipline problems with the kids! For real? Is that the payback for so much effort? So what do you do? You pass the buck. You most probably hear yourself in some of these sayings. The reason is that it is very easy to pass the buck and state that it is everyone else’s fault and not take responsibility. As a leader – you need to take charge! You lead by example. Don’t pass the buck. -Is there something you can do to make things better for the staff? -Create the environment for them want to do more and push themselves further? I’m part of several Facebook groups and recently I saw a comment from a director that blew my mind. I just sat there staring my screen with my mouth wide open! you expect your staff to push themselves and work hard and then your thank you is the quick and easy option! and you wanted a generic “cute” card – they aren’t 7! They are adults, they worked hard, say thank you like you would want to be thanked for working hours and hours on end for an event like curriculum night. This Director is a great person, and I know her well. She didn’t mean anything not nice. I won’t go into great detail of how this breaks trust, morale, teacher retention and actually creates whiny, emotionally needy and apathetic staff. 2. Write a personal card to thank them for the effort they put in to the curriculum night. Then go back to mistake #1 which is poor planning. Look at your calendar and make sure you are making the time for gratitude for your staff. They pay off is more than you can dream of. If you want even more strategies and tips on how to be an effective school leader then join me and thousands of other EC Leaders at the online event of the year! The EC Leadership Conference- we start November 5th. Chanie Wilschanski is a leadership coach focused on helping school leaders build a school of excellence by elevating teacher accountability, promoting a positive environment, boosting morale and improving retention. Chanie believes that - No matter the stage of your school, the size of your staff and children or how big your budget ---- schools are powered by the PEOPLE! As a mom of 4 little kids ages 4 months,3, 6 and 7, She loves to observe, do research and learn and make the time to read 1 book a week on leadership, school cultures, mindset and early childhood. 3 must-dos for parents and students during the private school admissions process.